The Lagos State Building Control Agency (LASBCA) has denied the reports that there is a new building collapse on Lagos Island on Monday. 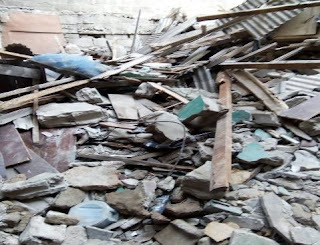 Some online and social media platforms had reported a purported collapsed building at 57 Egerton Street, Lagos Island, injuring a certain number of people. However, the Press and Public Relations Officer of the LASBCA, Mrs Titi Ajirotutu, revealed that whereas the agency is still carrying out the demolition of the marked distressed building in the area, the “minor incident that happened at the said building was not qualified as building collapse”. “I was with the team that went about to effect the demolition order this morning. “There was no issue of building collapsed; what only happened was that some scavengers were scavenging within an already demolished house and it was actually an iron rod they were trying to pull through the rubble but they got injured in the process. So it was a minor incident that happened,” Ajirotutu said.